A shemagh, also known as a keffiyeh or a hattah, is a traditional Middle Eastern headdress. Made from a square of cotton, shemaghs provide effective protection against the harsh elements of the desert like sun exposure and blowing dust and sand. The variety and variation of shemagh a person wears depends on the region he comes from. Israelis wear a cotton and wool headdressm which is either solid white in color or checkered red or black. A black and white keffiyeh is symbolic of Arab heritage, and in Jordan tassels signify a person’s status. Unfold the cloth and lay it out onto a solid surface like a counter top or table. Measure a 48 1/2 inch-by-48 1/2 inch square onto the cloth with the measuring tape and mark it with the chalk. Cut the shemagh out along the chalk lines with the scissors. Fold up 1/4 of an inch along all four edges of the shemagh using the tape measure and securing the fold with the straight pins. Once all four sides are done, go back around and tuck the raw edge under, re-pinning as you go, so that the edge is finished and won't unravel. Sew the hem into place with the sewing machine, removing the straight pins as you go. Sew one or two tassels on one or more corners of the shemagh with the needle and thread. This step is optional, depending on the look you want for your shemagh. Leave the edge unfinished, if you like. As it unravels with wear, tie the loose ends into tassels. Shemaghs and keffiyehs are traditionally worn by men, but women wear them, too. You can make a mini shemagh by cutting a piece of cloth 2 feet 1/2 inch by 2 feet 1/2 inch and finishing it in the same way as a larger shemagh. 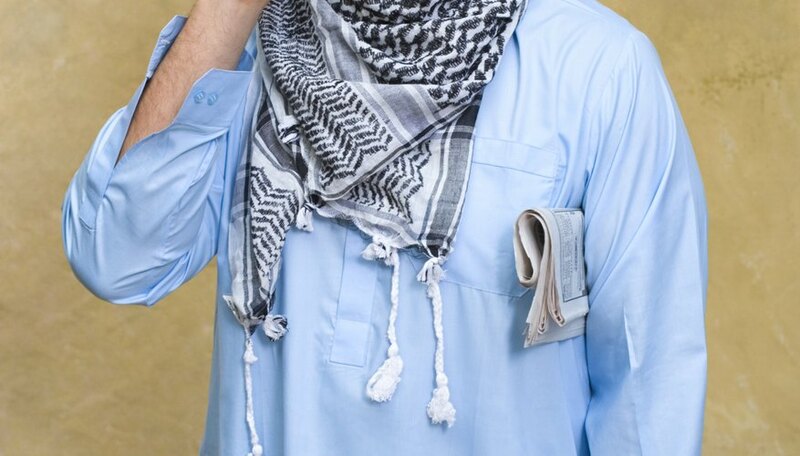 A mini shemagh can be worn tied around the head like a scarf.